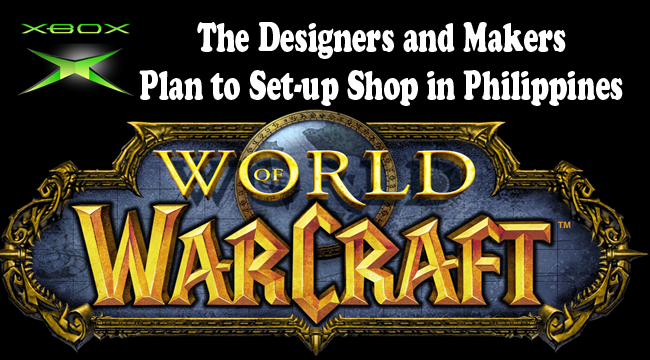 Designers and makers of highest earning and one of the most famous world wide computer game, the ‘World of Warcraft’, together with the Xbox games developers and the other seven foreign games publishing companies shared their plan to set up a shop here in the Philippines. This is such a wonderful news for the country that is known to be the home of avid gamers. Department of Trade and Industry released a statement saying that Warcraft and Starcraft developer, Blizzard Entertainment, together with the makers of Xbox, Microsoft Studios, will team up with other five gaming companies 2K, Activision, Electronics Arts, Ubisoft, and Square Enix-Eidos. Usec Ponciano Manalo, Jr. said that Filipino-American game developing companies of Canada and USA expressed their support for the Philippine’s game development industry. In the recent External Development Summit (XDS) joined by the Philippines, the foreign companies had shared their interest. The country now has a share of $136 million with regards to the global market for the outsourced game development and animation. With the growing population of professional gamers in the country, Philippines held a gaming festival on October 3-4 in SMX Mall of Asia. Held with the theme ‘Live to Play’, the Game Developers Association of the Philippines hosts the Philippine Game Festival. This annual event is open to all game enthusiasts, developers and designers all over the country. GDAP is comprised of over 30 members from both academic and business sectors which are united to boost the local game development industry. The organization aims to make the Philippines the leading country with the best game development.